It is difficult to argue with faith. Facts won’t do it. Faith is supported by authority, intuition , desire and simplicity. People want guidance from authority. People are programmed to believe their own intuition. People want simple answers to complex questions. Faith, presented by authority, gives them simple, intuitive answers. Faith cannot be undone by complexity. And that has been the problem. The populace has been programmed by authority — politicians, the rich, economists, the media — programmed to believe that federal financing is like state, local and personal financing. The notion that something so valuable as money can be created from thin air, is not simple. It violates the “no free lunch” mantra. The denial is reinforced by people in authority. So you are told the Big Lie, that “the federal government is just like you and your state and local governments.” Simple. And you are told, “printing money causes inflation. Remember Zimbabwe.” Simple. And you are told, “if the government could create dollars out of thin air, it wouldn’t collect taxes.” Simple. All lies. But oh, so simple. Here is faith: God rules everything. Yet, if you act badly, God will punish you. The fact that those two ideas are in opposition bothers no one. Faith wins; facts lose. Here is faith: The federal government can print money. Yet, the government needs tax dollars. The fact that those two ideas are in opposition bothers no one. Faith wins; reason and facts lose. Faith wants no reason or facts. Simplicity and authority are enough. Readers of this blog are familiar with the “Ten Steps to Prosperity” shown at the end of each post. ‘Ten Steps’? That’s not simple. It’s not intuitive. It’s not what the politicians and media and economists tell you. It’s not what the rich tell you. The people believe what they always have believed. They believe printing money causes inflation. They believe the federal government needs taxes to pay for spending. And they believe if you give people money, they will become needier and refuse to work, because only the rich have ambition. It is first because it is the most powerful step. Every year, the federal government collects more than a trillion FICA dollars from employees and employers. 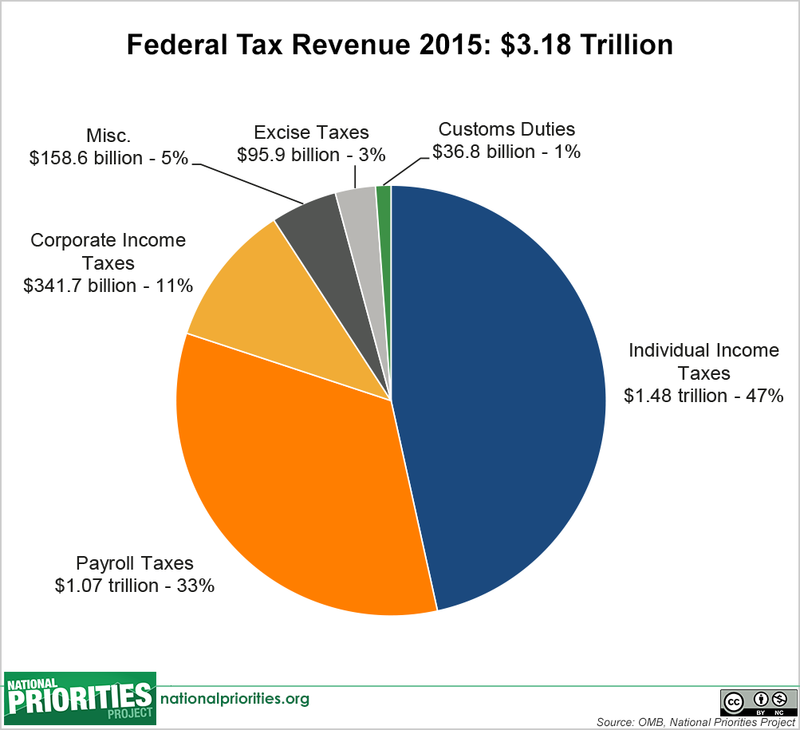 That’s about 1/3 of all the dollars the federal government takes in taxes. A trillion dollars taken from business and the middle classes! A trillion dollars taken from the economy! Every year! So here is a simple path to economic growth and to narrowing the Gap between the rich and the rest: STOP COLLECTING FICA TAXES. The government would continue paying Social Security and Medicare benefits as it always has. No change. But simply stop collecting FICA dollars. Stop taking a trillion dollars a year out of the economy. Stop impoverishing the middle classes by picking dollars out of their pockets. Stop increasing American business employment costs. Stop making American business less competitive vs. foreign employers. Stop pretending that Social Security and Medicare will run short of dollars. Stop pretending that Social Security lends dollars to other agencies in the government, which then supposedly pays the dollars back so Social Security can pay its bills. It’s a complex, Byzantine, Rube Goldbergian shell game. The American people would be more self-sufficient. They would have more money to spend on goods and services, on housing and health and education. U.S. business payroll costs would go down, the better to compete with foreign, low-wage businesses. The entire nation would prosper. And all that would be needed is for the federal government to stop collecting FICA. Perhaps the Ten Steps are too difficult for the populace to absorb. Perhaps we should focus on just one simple step. We have to keep a sense of humor about this stuff, lest we go mad. Dave Walker was head the GAO under Presidents Clinton and W. Bush. Walker says that the (fake) “national debt” is $65 trillion. People would laugh at the jokers, but people believe them when it comes to the topic of money. I see. When you sit in a baseball stadium, do not expect points to be added to the scoreboard when players score runs, since you will be expecting something for nothing. We can’t add points that we don’t have. The scoreboard must live within its means. It’s not like points are created out of thin air, simply by changing the numbers! Some of these clowns are paid to dispense lies, but others just want attention. Technically speaking, the US is only $18 trillion in debt; money already spent. The rest is future liabilities. When you get basic accounting identities wrong, why should anyone listen to these people? With respect, the $18 trillion does not represent “money spent,” since the U.S. government does not borrow its spending money from anyone. Instead, the $18 trillion represents the amount of money that various investors have deposited in Federal Reserve savings accounts via the purchase of T-securities. Technically the U.S. Treasury is supposed to issue T-securities whose nominal dollar value is equivalent to the federal deficit. However, many times there are no purchasers of these securities. Therefore the Fed “purchases” them itself. Almost half of the money deposited in Fed savings accounts was put there by the Fed. This means that almost half of the so-called “national debt” is owed by the U.S. government to itself. Thus, there is “crisis.” It’s all a bunch of accounting sleight-of-hand that is used to justify austerity. As for “future liabilities,” the U.S. government has none. Zero. Nada. If you could create money out of thin air like the U.S. government does, then would you have “liabilities”? KISS versus GIGO? Some choice! It might take a crash to start a change. Good point Rodger. All aspects of the Big Lie are integrated. Each aspect depends on the others. Likewise, all aspects of the truth are integrated. Each reinforces the others. So if we start demanding one simple thing, such as the abolishment of the FICA tax, the rest will follow, yes? This is the kind of specific demand that the “occupy Wall Street” people never presented. Abolish the FICA tax. Clear and unequivocal. People whose wages are $118,500 a year or less would get an automatic 7.65 percent pay raise. Currently if they are paid the minimum wage of $7.50 an hour, they now net only $6.93 an hour (not counting federal and state income tax withholding). If they work forty hours a week, then the FICA tax causes them to work three and a third hours for free. But without the FICA tax, they would take home an extra $22.95 per week, at the minimum wage. Employers would be happy, since they would not have to match their employees’ FICA contribution. By the way, employees whose wages are over $200,000 must pay a total of 8.64 percent of their wages for FICA, which includes is a 0.9 percent Medicare “surtax.” (Employers do not have to match this extra “surtax”.) So if my wages are $201,000 per year, then the IRS steals $1,447.20 from me each month, and destroys it. Imagine the goods and services I could buy with that money each month, thereby creating jobs for others. In December 2010, Obama lowered the FICA tax by two percent. The world did not end. On 1 Jan 2013 the FICA tax returned to 7.65 percent, and everyone meekly submitted to it. Average Americans submit to almost any theft from their pockets, but they go wild about guns, abortion, or refugees. Some people say we need the FICA tax so that when we retire, we can say we “earned” Social Security benefits. This “earning” will supposedly stop politicians from ending Social Security. Such people are in error. Politicians can simply claim that there are more people “drawing out” of Social Security than there are people “paying into” it. Voila: Social Security is “insolvent,” and it must therefore be privatized or eliminated. Dump the FICA tax. For the “taxes drive money” clowns, we would still have federal income taxes. Rodger says that federal deficit spending is absolutely necessary for U.S. growth. At any given time the GDP of any nation is either growing or shrinking. How much it is growing or shrinking is a matter of opinion, but GDP must be growing in order for the economy to be healthy. How much it must grow is (again) a matter of opinion. But if it is shrinking even a tiny bit, it is not healthy. That said, a growing GDP does not necessarily mean a growing use of limited resources. What if the U.S. government commissioned renewable energy projects that were big enough to put millions of people to work? In that case the GDP would grow, but we would not necessarily use up limited resources. GDP is essentially a measure of the amount of money that changes hands in an economy. If more money changes hands, then the economy is stronger. What the money is actually spent on is a different matter. Rodger has often discussed the need to boost innovation, R&D, and educational development. All these require a growing GDP. Even if we had “sustainable development,” and we concentrated on making everything renewable, and we used resources widely, we would still need a growing GDP for our economy to be healthy. And for that, we need deficit spending. Just as a growing GDP does not necessarily mean a growing use of limited resources, so does a shrinking GDP not necessarily mean a shrinking use of limited resources. Often a shrinking GDP causes an increased use of limited resources. For example, when rich people use austerity to crush the lower classes (in order to widen the Gap), they cause the lower classes to become desperate. They force the lower classes to cut down entire forests in order to have wood for fuel. They force the lower classes to use lakes and rivers as sewers. They reduce the lower classes to termites and locusts, desperately consuming everything in their path. Recessions do NOT lead to “sustainable development” nor “proper stewardship of resources.” Quite the reverse. Starving people do not care about conservation. They care about food. NOW. For “sustainable development” we need innovation, education, and R&D. We need people to have enough security to be able to visualize new possibilities. And for that, we need deficit spending. FICA is only the front side of this equation. In addition, Social Security benefit payments need to increase. More people are retiring without company pensions, leaving SS as their only source of income. At a minimum, no retiree(s) should live below the poverty line. I do not know how single retirees survive in major cities with an average monthly benefit of $1,335, less $105 per month Medicare premium. This is only the average benefit. Many live on even less after 30 years of labor. Undocumented workers get nothing. After the loss of a spouse, widows and widowers are especially hit hard. Only one benefit amount will be paid after the death of a spouse, resulting in reduction of dollars paid into the household, causing significant decrease in standard of living, and major lifestyle changes. Yes we must increase Social Security benefits. This would help beneficiaries, while boosting the economy, creating jobs for young people. We could further boost the economy by eliminating the income tax on SS benefits, along with the FICA tax. In a better world we would go beyond all this and have Universal Social security, aka a Basic Guaranteed Income. –What is excluded from income? And on and on, with Congress repeatedly carving out exceptions, until the whole thing resembles a variation on the tax code. I favor simply giving each man, woman and child in America a flat amount — $5,000? — tax-free. I agree that there may be problems, which is why I prefer the term “Universal Social Security.” This would be an expansion of the current Social Security program, and it would be run by the Social Security Administration. Monthly benefits would be would be high enough to offset poverty and homelessness, but not so high as to cause inflation or mass indolence. Q. What exactly is income? A. A monthly stipend, like Food Stamps or Social Security. Q. What is excluded from income? Q. Family and marriage variations? A. No. All U.S. citizens get the same benefit. Parents collect their children’s benefits until the children become 18. Q. Should wealth be considered? A. Perhaps we could choose a cut-off point. Benefits go to everyone whose personal sources of income total less than “X” per year. ($20,000 a year?) Fraud would be penalized just as today’s Social Security fraud is penalized. Q. Should geography be considered? A. No. If it is more expensive to live in one place than another, then people would have the option to move, and the money to do so. Many people would choose to live in rural areas, thereby relieving urban congestion. Q. Should dependents be considered? A. No. Dependents receive their own benefits. If, after consideration, Universal Social Security proves to be unworkable, then so be it. There are other options such as Rodger’s “Ten Steps.” Or, failing all else, we could simply increase deficit spending. Anything to move past our current culture of cruelty. That sounds nice, but the SYRIZA clowns in Greece said the same thing when the bankers installed them in January 2015. Everyone here at Rodger’s blog knew the SYRIZA was a sham. Why? Because SYRIZA defended the euro currency, and thereby doomed Greece to more debt and austerity no matter what. SYRIZA’s purpose was to reassure average Greeks while seeing to it that all lucrative public assets in Greece became privatized. Portugal is in a slightly better position than Greece, since Portugal has had an average 631-million-euro trade surplus each month for the last three months. However, for seven months before that, Portugal had an average trade deficit of 215 million euros per month. In other words, since June 2015, 1.9 billion more euros flowed into Portugal than flowed out of it, but for the seven months before that, 1.5 more euros departed from Portugal’s economy that entered it. Therefore Portugal is currently in the black by 389 million euros, right? Wrong. During those seven lean months, Portugal had to borrow euros, since the Portuguese government surrendered its Monetary Sovereignty to the European Commission, which has little if any fiscal authority. The European Central Bank in Frankfurt can lend money, but the European Commission in Brussels cannot create it out of thin air. The European Commission gets fiscal authority, such that it can give (not lend) euros to member states. Until one of these happens, euro-zone nations that do not have large and sustainable trade surpluses will suffer more austerity. Forever. During the last five years, France has had a trade deficit, except for a few brief spikes into the black (into the trade surplus side). That’s five years of bankers draining the French economy. If average French people think they are hurting now from mass layoffs, they had better prepare for a lot more of it. The only reason we haven’t heard the screaming yet is that France has the world’s sixth largest GDP. However France will continue to be drained. In the near future, France will drop to the seventh or eighth largest GDP. Economists will offer myriad hypotheses to explain this, but none of them will cite the obvious cause, which is the euro. Getting back to Portugal, yesterday’s election result represent a “SYRIZA moment.” Bankers and rich people in Western Europe use austerity to widen the gap between themselves and the masses. Their weapon is the euro, which makes austerity unavoidable for states that do not have large and sustainable trade surpluses. Austerity makes the peasants scream in pain. Therefore, to keep the euro-scam going, the bankers and rich people periodically install “leftist” parties which swear that, “The age of austerity is OVER!” Since the “leftist” parties defend the euro scam, they must quickly do an about-face and impose more austerity, whether they want to or not. When the masses get fed up with austerity and betrayal and meaningless “referendums” from the “leftists,” the bankers install a right-wing government, which promises relief. The right-wingers impose still more austerity, and the cycle repeats. Now Portugal has a “left-wing” government which swears that, “The age of austerity is OVER!” In Spain we see the same thing in the leftist “Podemos” movement. And the beat goes on. Right-wing or left-wing, austerity will continue as long as the euro-scam continues. Portugal is no exception. Is there NO ONE among the euro-zone’s 338 million people who understands the euro-scam? Yes, but not enough to make a difference. For example, Costas Lapavitsas is a professor of economics at the School of Oriental and African Studies, University of London. Mr. Lapavitsas was elected as a member of the Greek Parliament for the Syriza party in the January 2015 general election. Mr. Lapavitsas has been warning about the euro-scam for years. When he realized that the Syriza Party was wedded to the euro-scam, Lapavitsas defected from Syriza, taking with him 25 other Greek MP’s, and formed the Popular Union political party in August 2015. The Popular Union wants to dump the euro, but they have not yet received enough popular votes to have seats in the Greek parliament.